The file requires a spreadsheet program such as Microsoft Excel or OpenOffice. The planner file allows you to create 6 weekly dated planners and a dated 3-week objections list page. 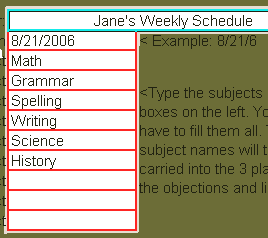 The planner can be personalized with up to 9 subjects and a planner title. To make the next 6 weeks, you do have to either delete content or start with a fresh empty file to create the planner for the next 6-weeks. Download the file and save it to your computer. On the Data page, type information in the white cells. The information will be imported into the 6 weekly planners and the Objectives & List worksheets. That is all you need to do unless you want to do more. The 6-Week Planner also comes in the 2-page per week version. New as of today, August 12, 2010. 1. [recommended] Start a New Planner. 2. [not recommended] Delete content from old planner and reuse it. On the worksheet with the Data tab, replace the sample information with your information. Type the child's name, the starting date, and the subjects. The information that you type in Data will be imported into the 6 planners and the Objectives & List page. Image darkened to highlight the area which takes input. 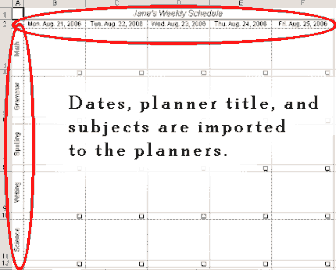 Note: If you want to add plans to the planner before printing, the cells have been formatted to wrap. Note: The areas that do not allow typing are not meant to be typed in. Typing in protected areas will ruin the file because it will overwrite the code. If you choose to unprotect the sheet, please be careful not to type in cells that have code. This image shows the Objectives & List sheet. It is an optional sheet. The purpose of the Objectives & List sheet is to have a place for jotting notes, lists, goals, or etc, for the 3-week period. 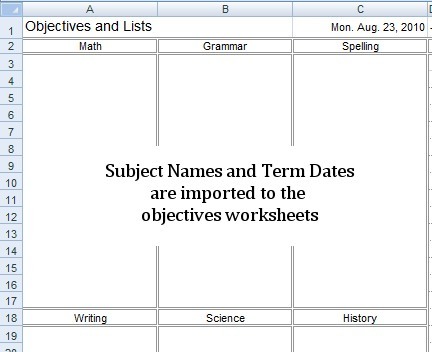 The name of the sheet can be changed to something else if you do not want to list Objectives. In lists, you can copy and paste lists into the file as long as the list has a return after each item. The list is 47 lines long and around 20 characters wide I think. Always check print preview before printing any Excel file that I offer. I have the settings to print properly, but sometimes that does not work well on other computers. Check it first. Look for the following in print preview: That each form is printing on one sheet each and how many pages are being printed. Print preview. 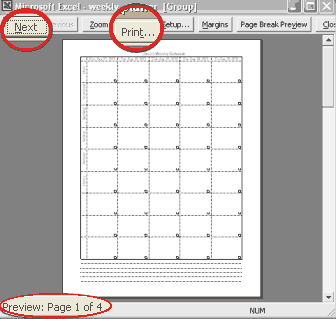 If you have chosen to print more than one page, use Next to look through all pages before printing. If a single form uses more than one sheet of paper, either adjust the margins or adjust the cells of the form. Selected tabs shown are white. To select: hold the ctrl key and select the ones you want. To unselect, do the same. If somewhere along the 6-week period, your family takes a week off, then you can "fix" the dates in this way. 1. Go to the sheet that has the "vacation" dates. 7. Protect Sheet, have fun on your vacation. When the six weeks is over, either replace data in current planner or start a new planner. If you have younger children who will follow about the same path, then it might be better save the old planners and to start a new planner for each 6-week period. Save your plans by backing up the planners to a storage device. To dress up planner, unprotect the worksheets and add clip art. Be careful to not empty or overwrite coded cells. To make line a 'return' in Microsoft Excel, use this keystroke combination: Alt enter. To unprotect a sheet, go to: Tools > Protection > Unprotect Sheet. Visit that menu again to protect the sheet.